This is my go-to holiday recipe. Nothing was quite as comforting as waking up on Thanksgiving morning (or mid-afternoon during my teen years) to the smell of sautéed onions and sage when my mom was baking this up. The original recipe included two cans of cream soup and one can of condensed milk. I’ve replaced those with a creamy sauce based on soy milk and vegetable broth. The directions list may look a bit long, but if you bake the cornbread the night before, it’s a very easy recipe. Also check out the beautiful casserole dish holder I snagged at the thrift store. It was all tarnished, but now it’s polished up and ready for the Thanksgiving dinner table! In a large bowl combine the cornmeal, 4 cups of flour, baking powder, salt, and sugar. Add in the shortening and mash with a fork (or pastry cutter) until the mixture has become fine and crumbly. Stir in the soy milk and pour into pans. I used a 9×13 cake sheet plus a cupcake to bake all of this at one time, but you can use any size metal pan to make this (adjust baking times accordingly). Bake the cornbread mix for 25-30 minutes, or until a toothpick comes out clean. Set aside to cool. While the cornbread bakes, chop the onion. Melt the margarine in a large saucepan and add in the onions. Saute until the onions become translucent, stir in the 1/2 cup flour until it forms a thick paste, then slowly whisk in the soymilk and vegetable broth. Once the sauce has thickened, remove from the heat and stir in the nutritional yeast, rubbed sage, and pepper. In a large bowl, crumble the cooked cornbread, then pour in the sage sauce. Stir until everything is well combined and there are no dry pockets of cornbread left. 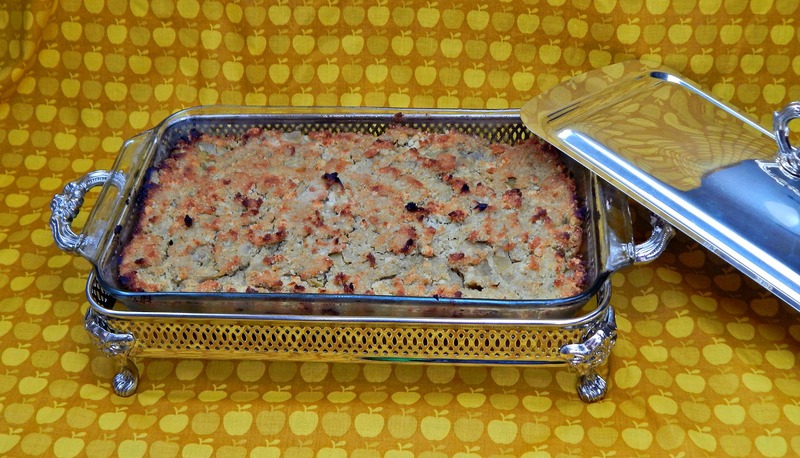 Pour into 9 x 12 glass baking dish and bake for 40-55 minutes. The way to tell if it’s done is when the bottom is a golden brown, and the top looks well baked.